It is a brisk walk in the 38 degree gray afternoon. It’s really all about keeping up with Nora and moving fast. It is not the day for a leisurely look around and notice what is there. It is about moving my body and feeling some heat in my bones. It is about moving enough to keep the toxins flowing out of my body in a productive way this last day of the nine days I have been cleansing. I do ‘The Master Cleanse’ (aka known as the lemonade diet) at least once a year. It is typically a ten day affair of giving the body a rest from its usual work of digesting food. It also allows for a complete re-set of habitual patterning at a cell level, and I never know what pattern is actually being cleansed each time I do this. Once the discomfort of the first few days of de-toxing are over, I find that I can move even more slowly than I am used to, all day long, and still accomplish so much. I have been able to ride a wave of pleasure and peace even in the absence of eating the meals I so love to make. For ease of keeping the work of the cleanse a priority, I typically limit my interaction with the world beyond my home to work related activities. And so it has become a kind of retreat, a happy one in which I have given myself full permission for being in this peaceful place. I feel the warmth coming into my joints while also anticipating what kinds of things I will make in the next few days to ease back into eating solid food. My last meal of creamed potatoes, green beans, and fish seems like ages ago already. 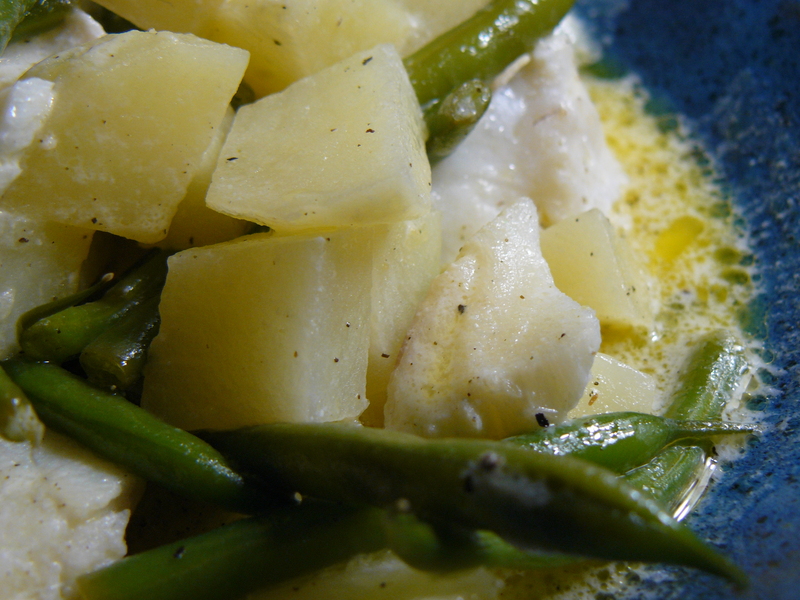 The cream butter wine sauce that coated the potatoes and became a broth for the chunks of thick cod to steam in was characteristic of the months of rich comfort food I had been craving. I broke the cleanse today after only eight days because I just knew it was time. Now my bodymind is ready for something altogether different. The next few days will be about gently consuming fruits and vegetables in preparation for the body to fire up its digestive engine again. And I can’t seem to get the pure white homemade almond coconut milk that I call ‘mother’s milk’ out of my mind. We are almost at the point where I know I will turn around and head back. Body still moving fast and mind still engaged with food. The flash of white to my left gives me pause. 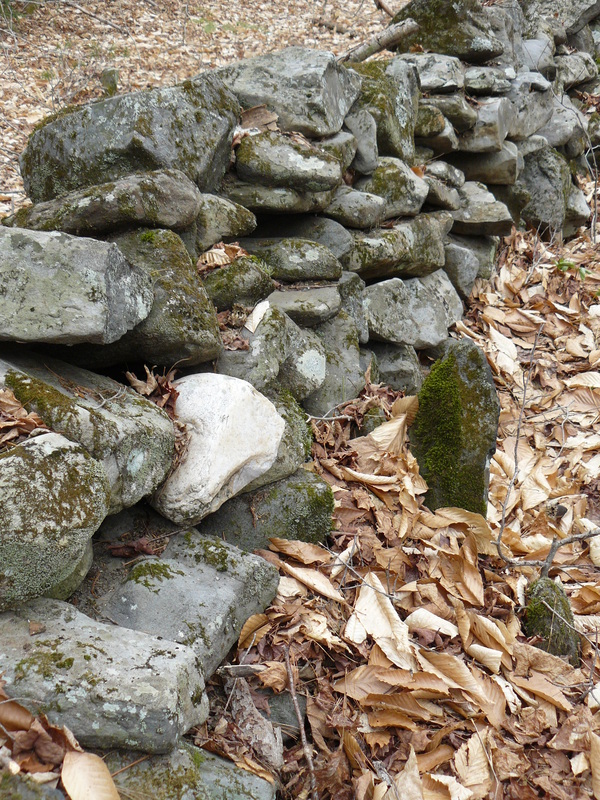 I notice it is yet another piece of the creamy pink quartz that seems to pop up and stud this landscape dominated by oxidized speckled moss covered granite. I stop and watch Nora forge ahead. 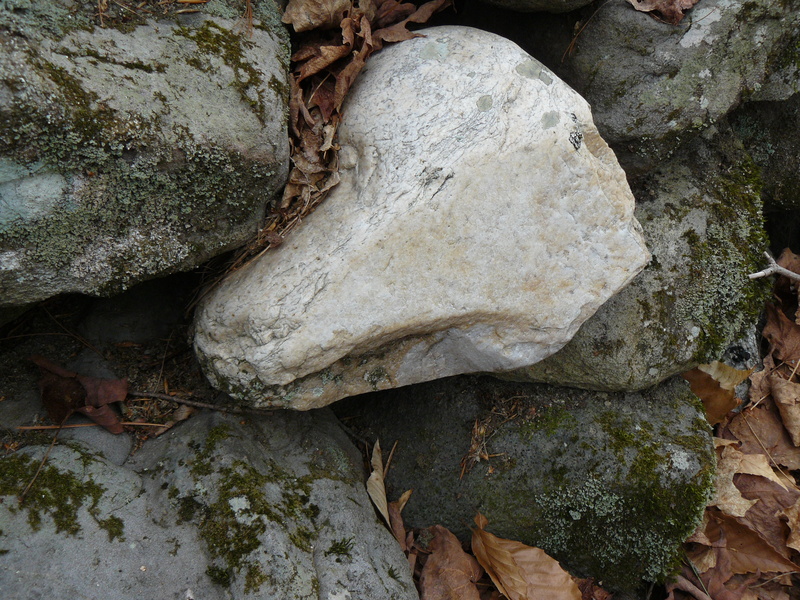 Then turn, pulled to this piece of stone that from afar just appears as light against dark. White Dolphin. Again. Long established as a totem for me, the significance of the sighting surfaces from a deep place in me that has no rational explanation or words. As I continue to walk along the association between mother’s milk and white dolphin is present and strong. Didn’t I already write about this years ago? I can’t remember, but once home, the nagging suspicion leads me to the post ‘mother’s milk’ written on September 28, 2011** just weeks after starting this blog. Here I not only give the recipe for the milk, but share the details of a dream that revealed the magic of White Dolphin to me years ago. It is a surreal experience reading my own words and like a visitor, detached from the source of that inspiration four years ago, consider what today’s message might be. Far away from the warm salt waters of its natural habitat, White Dolphin appearing in this unlikely context of forest and stone at this particular moment evokes the feeling of an eternal return. Not a path leading from A to B but rather the arc of the circle that always brings me back to the peace of exactly where I am right now, completely nurtured. Sustenance has become multi-dimensional in a very real and tangible way. I woke up this morning craving ‘mother’s milk’. It is what I have named the luscious combination of almond and coconut to produce a creamy white milk. I remember finding the recipe and knowing there was something significant about it and the first time I made this milk, it was magic watching the hard nuts and shredded dry coconut transform into something so white and pure! It is the word transformation that keeps coming to me. A mother’s milk transforms nutrients from her diet into breast milk. And an animal nurtured by mother’s milk is dependant on another for its basic survival, which is inextricably linked to affection and caring. Now the memory of a dream from fifteen years ago comes to mind. I am standing at the edge of a beach, dock & a boat. Then I am in the boat in the middle of a body of water, and all of a sudden, white dolphins start leaping out of the water over the boat. They just keep coming and coming and I am overwhelmed and thrilled at the same time. One stopped and took my finger in its mouth. I was afraid at first then relax and realize I am okay. Then there is a baby dolphin pushing its nose down my shirt, trying to get to my breasts. I realize that I have milk in my breasts, they are so full, so I squeeze some out and the baby dolphin starts drinking, then all of a sudden ‘he’ turns into a little brown boy, and I have the knowledge that this little boy will be human for awhile, but then grow into a great white dolphin. I could spend the rest of my life trying to analyze this dream. The message it brings to me is different every time I consider it. Today I am feeling the awe of transformation and how it is mother’s milk that nurtures this Spirit to change form. What a powerful metaphor for taking charge of one’s own transformation and ability to change! So I will endeavor to stay open to where I am needing some change in my life today. And I will make some ‘mother’s milk’ to honor this awareness. I’ve already put the 3/4 cup of (raw organic) almonds in a jar to soak. They will soak for about 8 hours to remove the enzyme blocking agents necessary for allowing the body to digest the almonds fully. 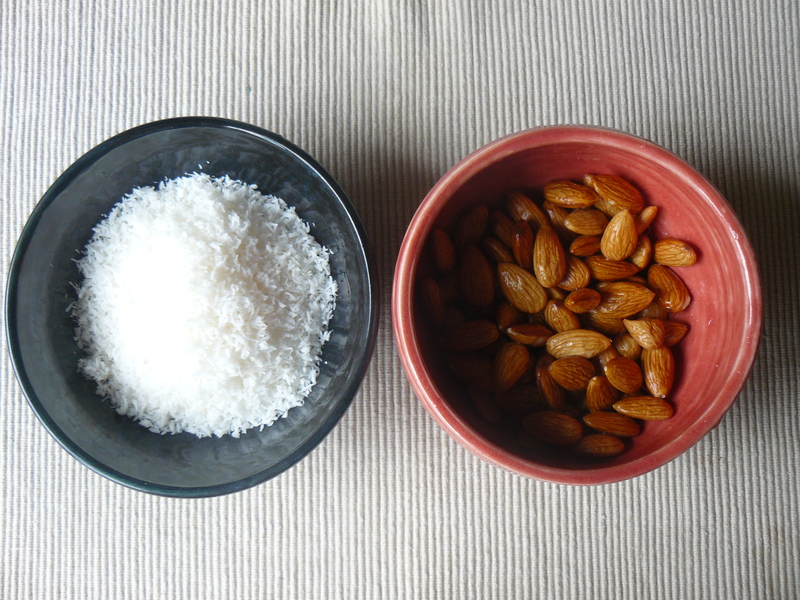 When ready, put the soaked almonds in a blender and grind for 10 seconds. Then add 3/4 cup of (organic unsweetened) shredded coconut and about 2 cups of warm (not hot) water and blend for 1/2 minute. Then fill the blender with warm water and blend again for at least another minute. I strain this mixture through cheesecloth into a wide mouth pitcher first. The first time I did this it was a little clumsy, but quickly learned just the right size of cheesecloth that would allow me to pour and capture enough of the pulp to squeeze out the milk that is in the pulp. It takes three or four rounds of pouring and squeezing to empty the blender, yielding about a quart of milk. Pour it into a glass quart jar for storage. It keeps in the refrigerator for about a week. It will separate some if it sits a long time (like mother’s milk! ), but just shake it up when you are ready to use it again. A few facts: contrary to popular myth, coconut milk does not transform into bad cholesterol to clog up arteries. In fact, cultures around the world that depend on coconut as their main source of fat have been found to be free of heart disease. The principle fatty acid in coconut milk is lauric acid, which is the same fat found in abundance in mother’s milk and is known to promote normal brain development and contribute to healthy bones. It also has important anti-carcinogenic and anti-pathogenic properties and is less likely to cause weight gain than polyunsaturated oils. Almonds are a good source of antioxidants. Research affirms that it is, in fact, a good alternative to breast milk. Almond milk has nearly four times the nutrition of cow’s milk except for vitamin B6. In other words, one cup of soaked almonds plus four cups of water will be equivalent to cow’s milk nutritionally (with the exception of vitamin B6). It will last in the refrigerator about the same period of time that cow’s milk will. It only takes two tablespoons of milk from a young coconut to supplement the vitamin B6. In addition to using this milk in all the usual ways, it is great to cook with, making curries and stir fry’s and brown rice pudding. Enjoy and feel nurtured…. I know I will…. Both posts, and I remember the first one, make ME feel nurtured and cared for. Now all I need to do is make some “mother’s milk” for myself. It sounds like the perfect thing to ease you out of your cleanse. Not to mention the white dolphin!